This function will give you information about the players connected to your server. The serveradmin will see all information. Highlight a person and click on Get Connection Info or right-click on a person and click on Get Connection Info in the popup menu. A status window will now appear. Under player info, information will be shown about the player such as Nick name, Login name, Client Version, Client Platform, Player Privileges, the current channel the player is in and what flags the player has. In the Connection Info section you can see some information related to the players connection. 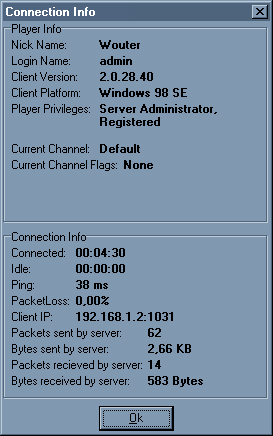 It says for how long a player is connected to the current server, for how long the player hasn’t said anything at the Idle line, the ping to the server, the packetloss the person is experiencing, if you are admin the IP of the persons below your status is shown (otherwise it says hidden), and the packets and bytes lines show how much traffic is generated to and from the server. By clicking Ok the window will be closed.